If you have been around 365 Days of Inspiring Media for quite some time, you would know that one of our favourite bands of late has been 6 sister group Cimorelli. We have reviewed plenty of their albums (Alive, Sad Girls Club, Best of 2011-12/2013/2014/2015/2016, Best of 2017), alongside many other posts that have reminded all readers and everyone else, just how important and influential these girls are in terms of impacting the younger generation in the realms of social media, either on twitter, facebook, Instagram or youtube. Formed by 6 sisters little over 10 years ago, we have been blessed over the years to hear from Christina, Katherine, Lisa, Amy, Lauren and Dani Cimorelli, as we see in fact, one of today’s most influential bands (I reckon), this turn of the millennia. Influential in the regard that I make this assertion and statement, that these sisters are by far one of my favourite all-girl group bands…ever! Maybe even one of my favourite bands (not solo artists, just bands)- either male or female fronted…ever. Being within the same group as other bands like Newsboys, Third Day, MercyMe, Casting Crowns, Tenth Avenue North, for KING AND COUNTRY, BarlowGirl, Switchfoot and Delirious? (with Cimorelli added, I think I’ve just listed my top 10 bands, ever! ); if you haven’t heard of the all-girl, all sister group originally from California (but now live in Nashville, Tennessee), well, then…google is your friend, I guess. 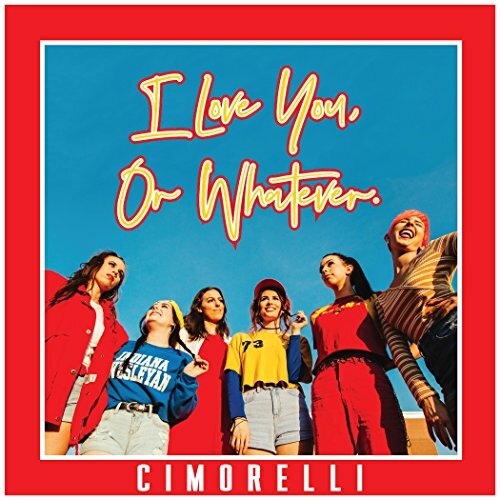 Cimorelli are some of the most honest, emotive, raw, hopeful, and encouraging artists that have influenced both the mainstream and Christian circles, delivering a myriad of pop and inspirational covers, alongside 5 EPs and 3 albums full of original material. These six sisters (all of which have a further 5 brothers; and are in a family of 11!) are as needed in today’s society, as role models to the young generation, as they are relevant and heartfelt, and much of their music, be it covers or original material, oozes such passion and fervour. With the band releasing a variety of cover material this year, alongside originally written songs ‘Thirst For Life’ and ‘Single on Valentine’s Day’, not to mention a few worship covers in ‘I Can Only Imagine/What a Beautiful Name’, ‘Oceans’ and ‘Reckless Love’, we are in awe of how these sisters can impact both the genres of mainstream music and CCM, at once. Their new EP, which released in July for those who pre-ordered online, and August 1st for everybody else, features more of a happier, fun, poppy sound compared to their sombre and more reflective Sad Girls Club last year, and thus, I Love You or Whatever is a reminder of how unique these sisters are, and with each album/EP release, their music style is unique and different- the girls have indeed moved from more of a country style musical undertone in Up at Night, to the worshipful Alive, the pop-reflective Sad Girls Club and now the summer-y pop goodness in I Love You Or Whatever. It’s no secret that here on this website, Cimorelli and their music has had a tremendous impact on our lives over the last year or so. Borne out of northern California, these young women who made the trek from California to Nashville not too long ago have been wowing us over the years with their musical ability. The sisters have continued to remind us to stay firm in the values that we have in this crazy world that we live in, being role models to specifically young girls and teens, but more toward the wider community of just young people who are trying to figure out their place in a world like we are in today. While each member of the band is strong in their Christian faith, much of their discography appeals both musically, lyrically and stylistically to a much broader audience than just the Christian faith community that much of the CCM artists cater towards. Now fast forward to 2018. The band have continued to amass a following, that has continued to grow further through the advent of a podcast not too long ago (called The Cimorelli Podcast, of which we reviewed for the site here! ), along with them still uploading music videos of covers and original material each week. The sisters have even launched their own patreon site not too long ago, alongside uploading 2-3 videos a week to their youtube.com/cimorellitheband page instead of the one per week, prior to 2018. These 6 sisters are literally influencing the world in a positive manner through their online digital youtube presence, and while much of their fans have unveiled their own longings for them to tour for their albums (which they haven’t done on a regular basis since 2016), I’m sure that each of the sisters are content to where they believe God is calling them now for their ministry- on the internet at the moment. Which leads me to this review of I Love You Or Whatever– their new EP, and their first EP release since their 2014 EP Renegade, their last on a high profile label before they split from it and moved from California to Nashville. Just one listen of the EP as a whole, and you know that you’re in for a treat. Much different from the pop-country Up at Night, the worshipful moments of Alive, and the indie-pop mellow/reflective nature of Sad Girls Club, this new EP consists of essentially 4 songs and 3 spoken words, something different and far beyond anything they’ve ever created in the past. The general feel of the EP is much more upbeat and positive, and is a departure from some of the emotional moments shown in Sad Girls Club. This is an EP to hear on long car trips, to put in the background during a gathering or a party. Or just personal, private hearing. Whatever the case, this EP is much more accessible, and I’m sure a myriad of people will enjoy a project like this. ‘Superstar’, the EP’s first single, released in July 2018, and is the first song on the EP- the song itself showcases a hopeful situation where the persona is in love, and declares their significant other as a ‘superstar’, and that ‘…we’ll always be together, you and me forever, never wanna lose you, babe, cause you’re my superstar now, I’m never gonna let you get away…’ The song itself is overall positive, and reminds us all, that as far as us being superstars, though we may not think so, our significant others (if we have them) may still believe us to be that- superstars. We impact the world each day and we may not even know it, and Cimorelli’s new song is hopefully a reminder of this. The remainder of the EP is as different and unique, compared to ‘Superstar’, frankly the most CCM song on the EP. ’32 Degrees’ is an ultimatum-type song, where we are presented with a message of ‘figure out your life and stop toying with an idea of a relationship instead of having a relationship’- a harsh message nonetheless, but all in all, the song still is set with an upbeat backdrop. That’s probably the only downfall, that aside from ‘Superstar’, much of the lyrics of songs on the EP are full of emotive and heavy things- ’32 Degrees’ presents a message of needing to not be friend-zoned, while ‘No Good’ delves into the issues of loneliness, and for the sake of not being lonely, the persona may hold onto a relationship that could easily die instead. ‘What Kind of Girl’ goes out to all the haters and declares boldly to potential boyfriends, that ‘…if you want me, show me, love me, know me, don’t just think I’ll keep this going, I’m sweet like sugar but I’m cold as ice, I’ll be gone like the summertime, you better think twice…’, all the while standing at the shortest length of the songs on the EP, a tad under 2:30 length. And while all these three messages aren’t necessarily as Biblically based as much of Alive was, what is good about I Love You Or Whatever is their honesty and heart, still present on the EP as the six sisters encourage us to say the words ‘I love you’, to whomever I’m sure the Lord will want us to say it to, be it a little while from now, or now, next day now. The EP then ends with the spoken words ‘Minefield’, ‘To Be a Human’ and ‘Summers in a Small Town’, by Dani, Katherine and Amy Cimorelli, respectively. ‘Minefield’ is a heartfelt moment of realising that loving someone isn’t enough if they don’t love themselves- and thus, setting up minefields that we can step into, while ‘To Be a Human’ allows us to see a contrast- all the things that make up what it is not to be a human, compared to things that we celebrate, as humans, and ‘Summers in a Small Town’, a spoken word of how there’s hope and wonder, often in small places where we can find it cozy and relatable to people around us. Both ‘To Be a Human’ and ‘Summers in a Small Town’ are some of a my favourites, not just on the EP, but throughout all of the band’s cover/original material- ever. Cimorelli and their commitment to delivering quality music, be it covers or originals, has taught me that there is a wide variety of music out there at my grasp, and ‘mainstream’ music isn’t that ‘bad’ or ‘inferior’ to Christian music. In fact, God can indeed speak through anything, even a song that wasn’t necessarily written with Jesus at the forefront. Mainstream music can encourage, and Cimorelli has shown us, myself especially, that mainstream songs, can in fact help us on our journey of life, and tell us more about ourselves and God in the whole process of this crazy period from birth to death, called an exciting adventure the Lord is calling us all out to participate in. My musical tastes have been broadened because of Cimorelli, and for that I am thankful and grateful. Music is the universal language of the soul, and as these 6 sisters continue to deliver harmonies and melodies as emotive and poignant as they have been for years, then the world will be a better place because of it. I Love You or Whatever, albeit shorter than the other albums, is not just for anyone who loves current radio friendly pop music. It is for people who love music, full stop. Cimorelli are underrated, and hopefully with this EP release, alongside their most recent album Sad Girls Club, we can see the journey of how a little youtube cover band can be transformed into a band that is influencing many young teenagers and young adults (especially teen girls) around the world to this day! Well done Christina, Katherine, Lisa, Amy, Lauren and Dani for such a heart-warming yet equally confronting set of songs, here’s to the EP impacting many, many lives in the upcoming months and years ahead!